In turboDial you can add a special designation to each Call Note to indicate the outcome of that call. You can customize the “Call Outcome” choices to be a list that is specific to the needs of your company. 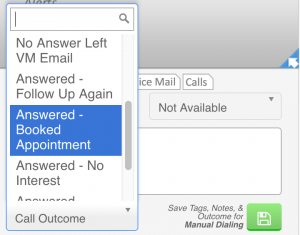 If your Call Outcome selector shows “Not Available” then your Call Outcome custom field has not been created. See the guide section on “Call Note Custom Fields” for information on setting up your Call Outcomes in the Call Outcome custom field. You can create dashboard reports based on the Call Outcome. See the guide section titled “Reports and Metrics” for more information. Your Call Outcome choice is saved in the note record when you press the Save button.